The articles published in Medical Mycology: Open Access have been cited 6 times by eminent researchers all around the world. 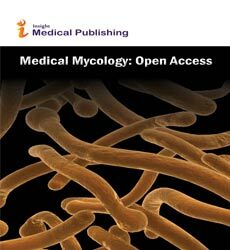 Following is the list of articles that have cited the articles published in Medical Mycology: Open Access. Goyal S, Bhusnurmath S, Bhusnurmath B, Jain A (2017) A case of pulmonary histoplasmosis with lymphadenopathy mimicking malignancy. Human Pathology: Case Reports 8:16-17. Dey P, Gola D, Mishra A, Malik A, Kumar P, et al. (2016) Comparative performance evaluation of multi-metal resistant fungal strains for simultaneous removal of multiple hazardous metals. Journal of Hazardous Materials 318: 679-685. Mishra S, Kumar P, Malik A (2016) Suitability of agricultural by-products as production medium for spore production by Beauveria bassiana HQ917687. International Journal of Recycling of Organic Waste in Agriculture 5: 179-184. Bajaj S, Saboo SR. A study of the prevalence of HIV-1 infection in cases of pulmonary tuberculosis. Avkan-OÄuz V, Baykam N, Sökmen S, Güner R, Agalar F, et al. (2016) Recommendations for intra-abdominal infections consensus report. Ulusal Cerrahi Dergisi 32: 306-321. Åenol Å, Kutlusoy OE, Kaya O, AvcÄ± M, TaÅbakan M, et al. Solid Organ Transplantasyonu YapÄ±lan Hastalarda Antifungal Profilaksi Antifungal Prophylaxis In Solid Organ Transplant Recipients.